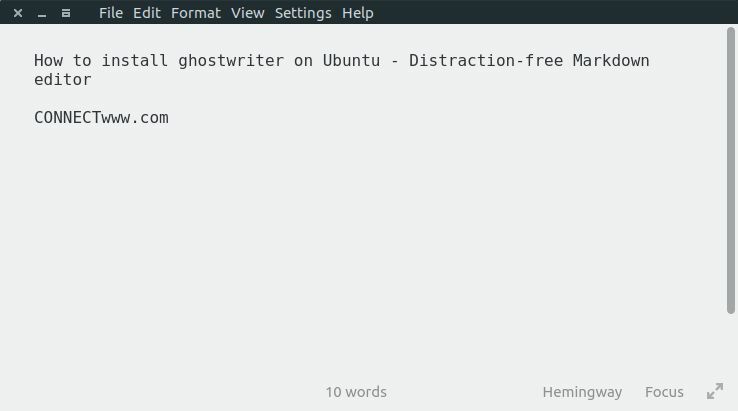 ghostwriter is a free open source distraction-free Markdown editor for linux and Windows. The full screen mode, a clean interface and the focus mode of ghostwriter gives you distraction-free writing experience. Focus Mode allows you to highlight only the current text around the cursor while fading the rest. It comes with built-in light and dark themes and you can also create your own theme by adding a background image. Another important feature is Live HTML Preview. Using ghostwriter you can export the document to HTML, Word, ODT, PDF or any other format. Open your terminal app in ubuntu and add ghostwriter PPA by running the below command in terminal. Type your Ubuntu password. Then press the enter key. This will add the ghostwriter Markdown editor’s PPA on your system. Then run the below command. After that type the below command and press enter key to install ghostwriter Markdown editor on Ubuntu. Type Y and press the enter key to confirm the installation. After the successful installation of ghostwriter Markdown editor restart your ubuntu. Click the Dash home from unity launcher. And type ghostwriter in the search field. Then click ghostwriter Markdown editor to open it.